Our Playground Consultant, Marion McCall, worked in partnership with The Fourfields Primary School to create an open-ended playground environment that promotes inclusive play and cross-curricular activities. 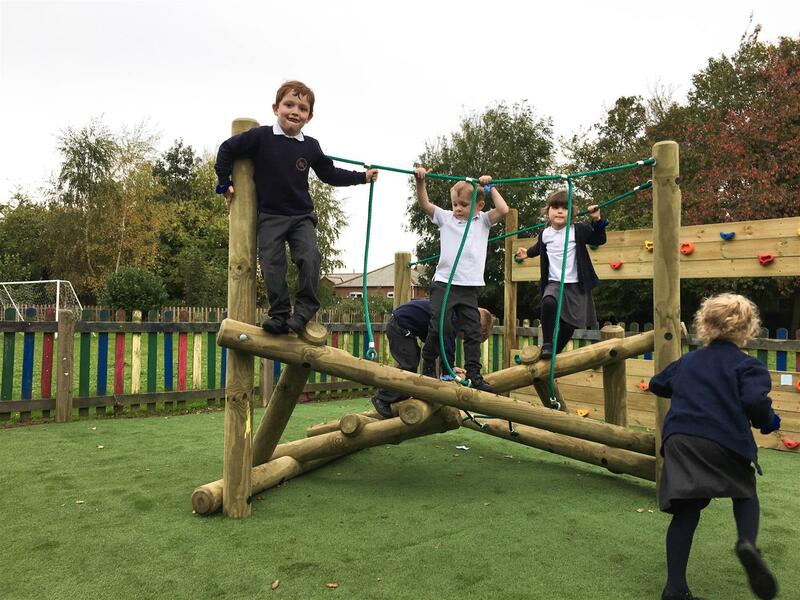 We created this fantastic environment through the installation of engaging outdoor play equipment that will help develop the school's EYFS children through the 7 areas of learning. 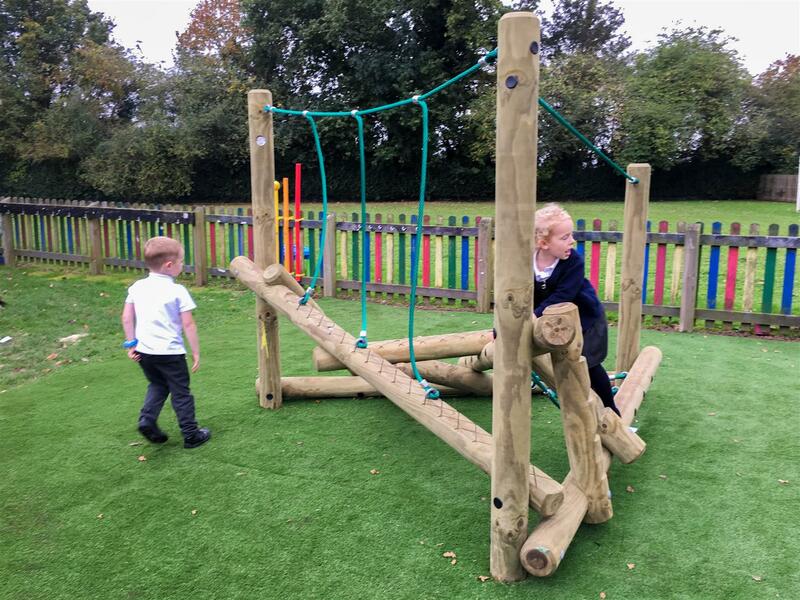 The play equipment will act as a stepping stone for children's continual development and prepare them for harder challenges when moving up the year groups. For physical development, we installed some introductory playground equipment that encourages children to climb and practice traversing. This will help build their climbing confidence and begin to develop their muscles and fine motor skills. The physical zone includes our Kinder Scout Climber and Single Sided Climbing Wall. 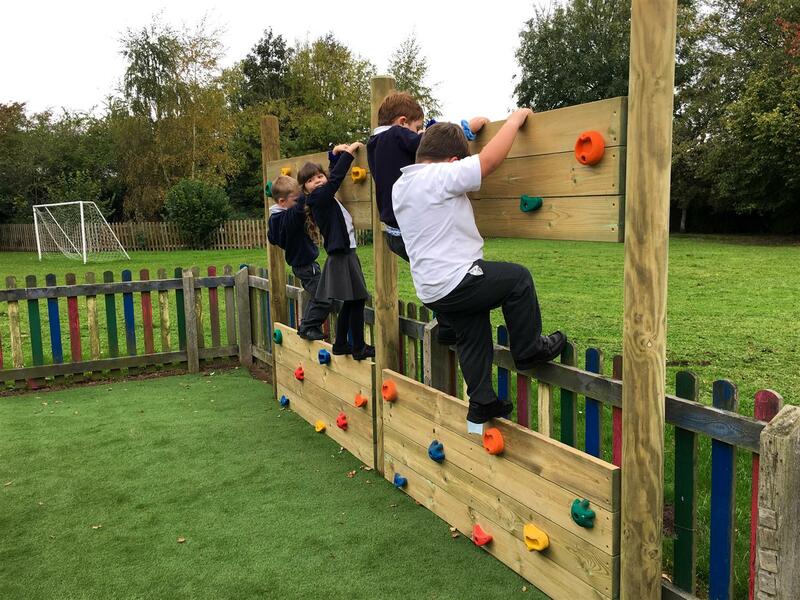 The Kinder Scout Climber is our smallest climbing frame and will develop children's balance, upper/lower body strength, coordination, core stability and fine motor skills through grip and grasp. As their confidence grows, they will begin to take more safe risks which will further improve these key skills. Our Single-Sided Climbing Wall focuses on children’s fine movement skills and places an importance on children’s fingers and feet while traversing. Climbing walls work by getting children to use the hand holds to cross from one side to the other. Children will be able to decide what route they want to choose based on how confident they feel. 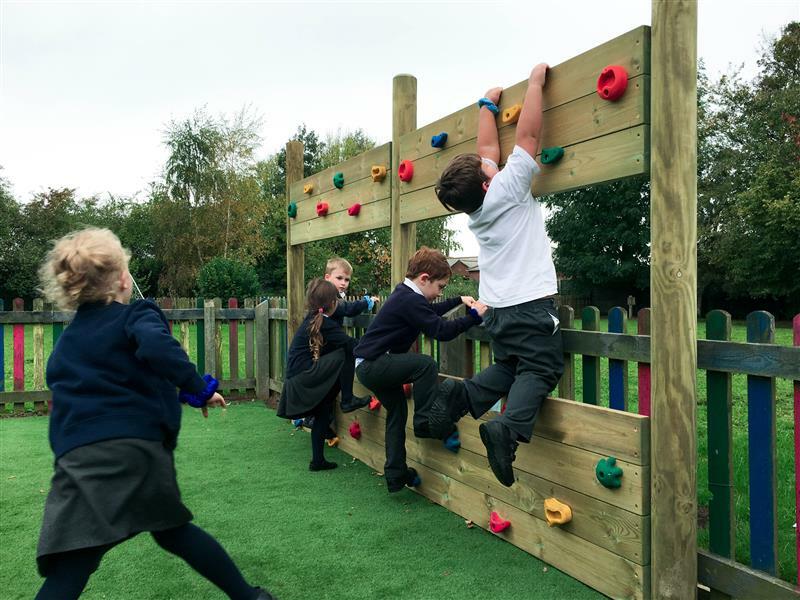 Whilst playing and climbing children will be testing, but developing their upper and lower body strength as well as their fine and gross motor skills. 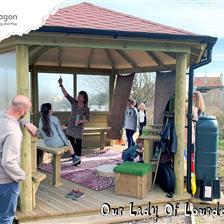 We created small seating area with our Moveable Seats for social development, outdoor discussions and reading sessions. 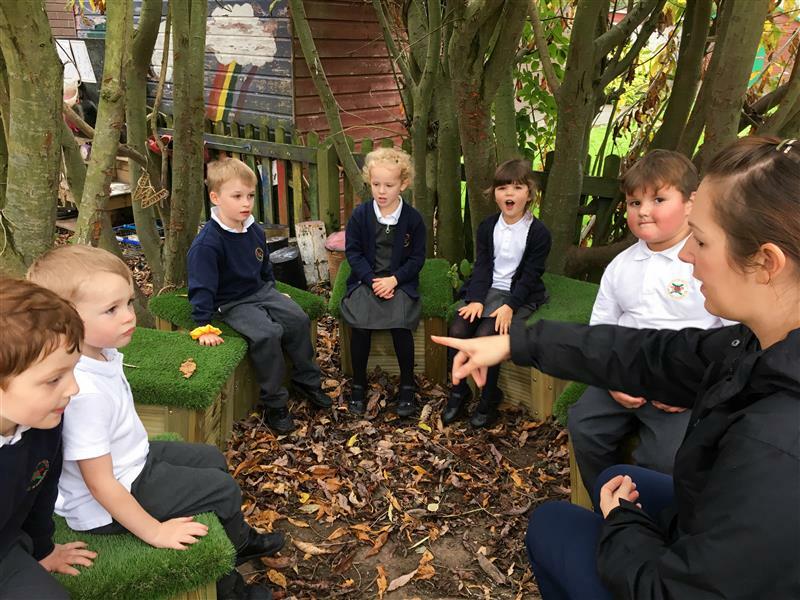 These natural looking seats offer a versatile and alternative seating arrangement that can be changed and adapted regularly to suit the school's teaching needs. Giant Playhouse – Shelter or shade, a special secret place for role play and drama and connecting with friends. A truly versatile and open-ended resource. Easel Table – Children can sit down, share ideas and get creative with mark making. Practice motor skills, letter and number formation, and experiment with art and design. Wipe clean and go again! Covered Sand Box – Inclusive outdoor play comes to life. Children can manipulate the sand, dig for treasure, pour, sift and scoop to fine tune physical movements. We also included two Tuff Spot Tables to provide the children with a versatile sensory play and learning station for art, design and exploring materials and textures. 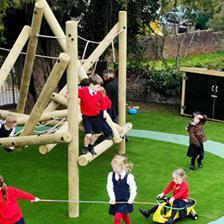 If you would like to further develop your playground environment, complete our Contact Form and we will be in touch to arrange free consultation. 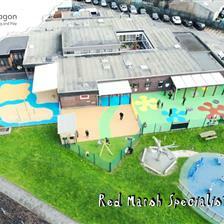 Alternatively, you can call 01625 890 330 (Northern Office) or 0117 379 0899 (Southern Office).